In Form Charts are charts that can be set up to appear in the actual event form when you are entering in data into the form. They can pull data from any event form on the system. Unlike Inform Reports, fields pulled from event forms to appear in the charts in the Mobile Version DO NOT need to be set up as enable mobile access. They will appear without being set to enable mobile access. See the examples in the steps below to find out more. However, they will not appear offline as they cannot link to the respective data source. In Form Charts appear in the Mobile Application. The chart appears in a separate page/section to the rest of the Event Form fields. In Form Charts appear in the Mobile application. Each Inform Chart will appear in a new page (e.g. no other fields will appear with it) as shown here. This may mean you need to change the order of some of your fields to ensure minimal page breaks. 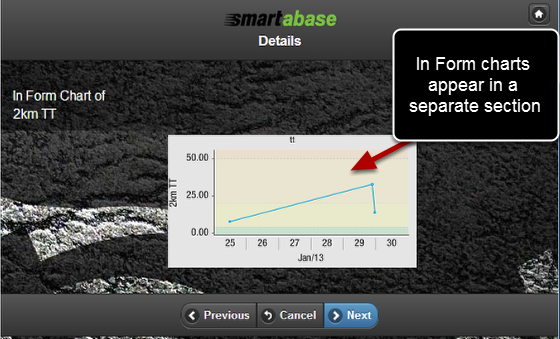 If you have an inform chart 1-2 fields before the end of a section you many need to move it. The image here shows the two In Form Charts that were set up in the step above. The first chart shows the graph and the data. 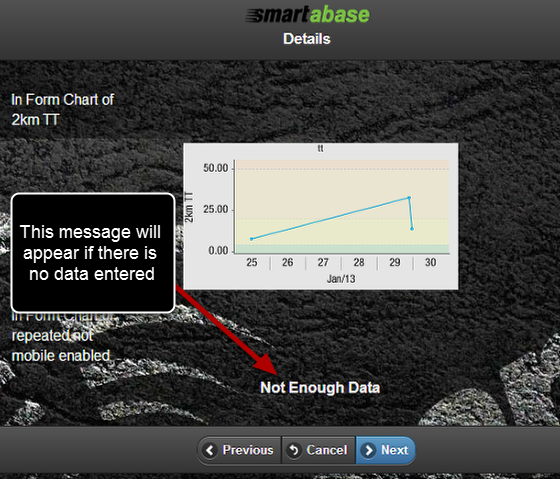 The second chart is display the "Not Enough Data" message because less that 2 events have been entered and the charts require a minimum of two variables to graph. Just remember when you are testing your Event Form on the Mobile App that charts need at least 2 data points to chart. Always enter in at least 3 data points to test your charts.